Uflex was recognized with seven awards at the recently concluded SIES SOP STAR AWARDS 2018 for packaging innovation and product development. 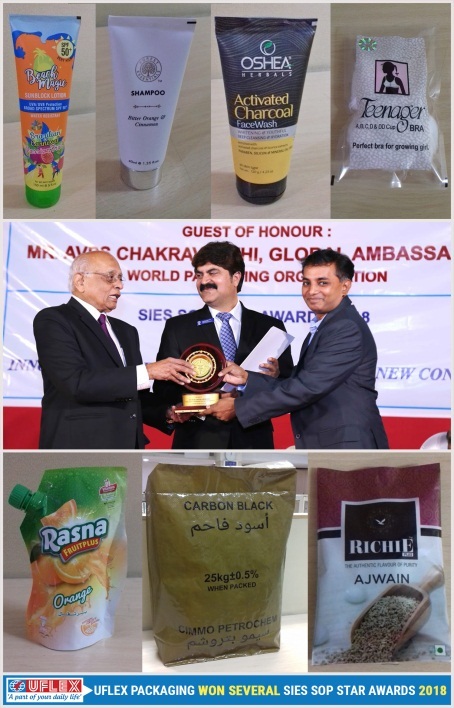 In its endeavor to support and encourage the packaging sector, The SIES School of Packaging announced the awardsfor excellence in packaging with emphasis on Innovation, Creativity, Development and New Concepts. The eminent jury members followed a strict judging criteria based on innovation and creativity, graphic design and improved aesthetics, user friendliness and new developments, thus recognizing the R&D efforts of Uflex in developing newer materials, forms, process, machinery and technology in the field of packaging. Previous articleNTNK inks – Are they really safe?